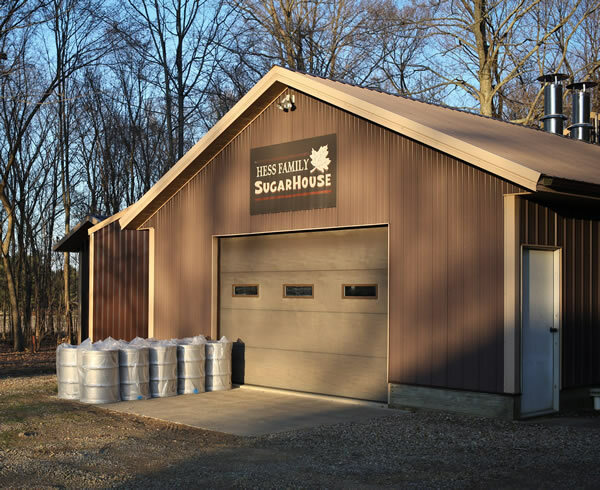 The sugar camp for Ohio Syrup from Stan Hess Family Maple Syrup is located In the heart of Ohio's rich farmland surrounded by tall maple trees. The Stan Hess Family Sugar Camp has a tradition of high quality maple syrup production that has flourished over the years. Combining our attention to detail and the cleanliness of our sugar house produces a maple syrup with superior taste. With these extremely high standards we give you maple syrup made with extreme care and devotion. Our sap is collected using nearly 40 miles of tubing, all of which are under vacuum and located within a 10 mile radius of the sugar house. The tubing consists of mainline with branch lines bringing sap from trees. The sap comes to a releaser which pumps it to stainless steel storage tanks. From the storage tanks, the sap is pumped through a reverse osmosis machine to the evaporator where it is boiled to pure syrup. It is pumped through a filter press and hot packed into stainless steel drums for storage. When ready to jug our syrup into various sized containers, the drums are opened and the syrup is pumped into a finishing unit which heats the syrup. After the syrup is heated it is pumped through a filter press into a water jacketed canning unit where the jugs are filled. In addition to our maple syrup, we also produce all natural pure granulated maple sugar. Stan Hess Family Maple Syrup ships to all regions of the United States. Our products are marketed in local stores and featured in restaurants both in and out of the state of Ohio. Our mission is to provide a top quality product to our customers in a timely manner. We truly hope the delightful taste of our pure maple syrup and pure maple sugar are an enjoyment to you, your family and friends.